We are completely aware of the fact that cleaning tile grout is one of the most essential tasks to keep up the floor tiles. Grout is a porous substance, made of water, sand and cement, which is neither stain proof nor waterproof. So you can imagine how daunting the process of cleaning can be. Moreover, they tend to absorb grease and dirt faster than tiles. That terrifies you, right? Don’t worry, there’s a solution for every problem. So what can be the simplest tile and grout cleaning solution? The simplest of the process is cleaning it with warm water. However, before cleaning it with warm water you need to vacuum the floor and remove all the dirt and soil present. But when it comes to deeper stains, you need to work harder and apply more thought to it. The first thing to consider is the cleaner. Although there are Ph-natural cleaners available, you can try a home-made product. So how can you prepare the home-made product? You can mix white vinegar with water in a 1:1 ratio. If you are not satisfied with this, you can mix water and dish detergent along with some baking soda. However, we recommend the first one as the ideal solution as it hits the stains directly but gently, and cleans stubborn dirt. Moreover, you will not smell any chemical fumes while cleaning the dirt. Just ensure that you apply it with a moderately stiff bristled brush. Hence, you will need following things that are needed for tile and grout cleaning: White vinegar, water, a stiff-bristled brush and a spray bottle. 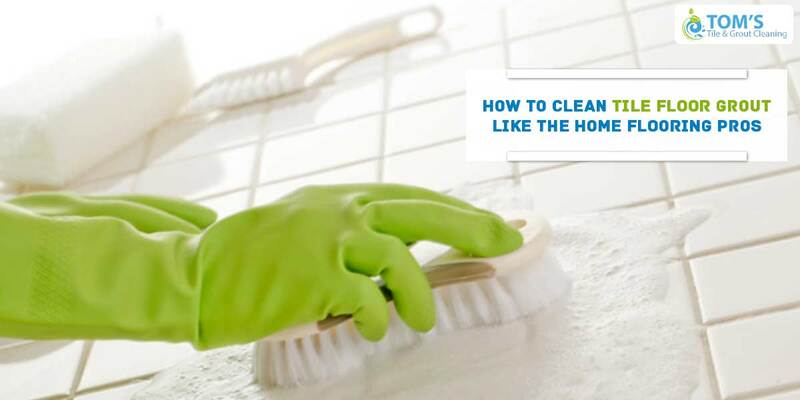 First, you clean the tiles by sweeping the floor in order to remove the gritty dirt. Later you prepare the solution and set the ‘spray’ mode instead of ‘stream’ until you are very good at it. It’s essential to verify that the grout gets well-covered. Next, leave it for 5-10 minutes, in case of walls or as long as it stays wet. If it is the floor, then leave it for 20 minutes. Spray for the second time and then scrub it with the brush. Clean the grout with a scrub which can be used in a circular motion. Finally, rinse the scrubbed area and see the difference yourself! Now for the tough ones! One of the toughest grout stains is the oily stain. Here, if the ordinary process fails, you may use a poultice. Soak poultice powder in water and apply it to stains. In order to make it effective, it is essential that your poultice remains wet. Then there are mould and mildew stains, which are challenging. Here you can apply chlorine bleach. Later use a milder method. But remember that bleach often discolours the tiles. So, in case of natural stone tile, dish soap, hydrogen peroxide or baking soda is more useful. Finally, there are soap-scums that need to be removed. You may use a plastic putty knife to get rid of thick soap scum. Plastic ones are safe as metal knives may leave scratch marks and damage your tiles. Even if some stains remain on the tiles, it is better to call the professionals. The tile and grout cleaning Melbourne services will help you to clean tile floor grout.